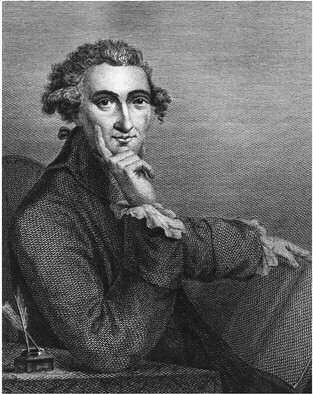 Engraving of Thomas Paine, seated, hand under chin, at desk with inkwell, 1791. Courtesy Wikimedia Commons. This past October, the Institute for Thomas Paine Studies (ITPS) at Iona College hosted the conference, “Revolutionary Texts in a Digital Age: Thomas Paine’s Publishing Networks, Past and Present.” Over the course of three days, participants from many different professional backgrounds engaged in a conversation between practitioners of digital humanities and early Americanists. Bridging archival and museum studies, library science, history, literature, computer science, political science, and education, “Revolutionary Texts in a Digital Age” explored how the study of digital humanities, particularly communication networks, sheds new light on the study of early America and offer a parallel story. Debates surrounding DH tools and methodologies, particularly when they intersect with the current political landscape, both mirror and complicate how we study and teach questions of media, technology, and political publishing in the late eighteenth century. The following roundtable aims to continue this conversation, appropriately, in the digital sphere. Inspired by the joint issues in the winter of 2017 of the Journal of the Early Republic and the William and Mary Quarterly, the Panorama and the Junto will each share several pieces related to the broader themes of “Digital Research, Digital Age: Blogging New Approaches to Early American Studies.” Building off of similar questions from the October conference, this roundtable will address two sets of question based around the conference themes: 1) How stakes in the digital humanities today intersect with, illuminate, or are illuminated by the challenges and efforts of media and politics in the Age of Revolutions? and 2) How DH methods and tools work in the study of early America more broadly? Nora Slonimsky is Gardiner Assistant Professor of History and Director of the Institute for Thomas Paine Studies at Iona College.